I get it. You’re not in the habit of giving too much thought to backflow installation or naming specific equipment for the backflow preventer assembly. Most of us wouldn’t know a good one from a bad one anyway. In fact, you may not even be able to identify one in a plumbing fixture lineup. As long as each water line has at least the basic protection it needs to prevent a backflow event, nothing else matters, right? Well, no, not exactly. In fact, there are four important reasons to specify more detail and none are about quality. Lets talk about size, hydraulics, class, and aesthetics. 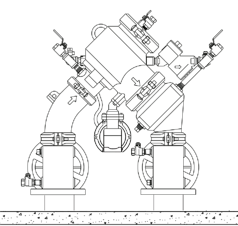 Until a few years ago, most of the flange-sized assemblies were derived from a single form factor as pictured below. 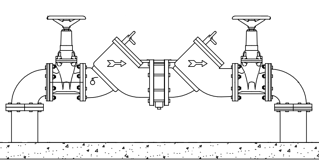 A vertical riser through the concrete slab, turned 90° and then a series of gates and valves, all oriented horizontally in succession, then another 90° back down through the concrete slab. The new “n-type” backflow preventer solutions turn the shutoff valves into the horizontal plane and place the 90° turns within the boundaries of the shutoff valves rather than beyond them. The result is a much more compact assembly like the one pictured below. With a smaller assembly, you get a much smaller backflow enclosure. In fact, the covers for these new designs are as much as 70% smaller than their predecessors. If your client has a choice, there is little doubt which version will be preferred. Unfortunately, these n-types have not caught on. They are not being offered on supply house bids because they’re more expensive. They don’t cost much more, but more, nonetheless. When a supply house bids an entire project, they are seeking to win the bid by offering the contractor the best price. Suggesting a more expensive BPA than is absolutely necessary, even if it’s only a few hundred dollars more, is a sure-fire way to lose the total bid package. The good news for your client is that at the end of the day the total package, including the BPA and the backflow preventer cover, is not more expensive. Because these assemblies are so much more compact, the boxes that surround them are much smaller. They are less expensive - enough to offset the added cost of the assembly. Of course, supply houses are usually aware of this, but while the BPA is commonly part of the initial bid package, the enclosure is usually not. This is often because the enclosure isn't specified initially, and only comes as a realization at the very end of the project. That omission, the lack of an enclosure in the bid list, hides the evening-out effect of the total package cost. So even if you are reluctant to specify an actual model number from a specific manufacturer, you should always specify n-type as the assembly type because while some are smaller than others, every n-type design from all the major manufacturers is smaller than their conventional brethren. All backflow preventer assemblies are not created equal. Beyond that, no single model enjoys primacy in all pipe sizes. Before you make a life-long commitment to one model or even one manufacturer, consider our head loss chart. It puts all the products manufactured by Ames, Apollo, Febco, Watts, and Wilkins in a head-to-head comparison. It may be the only source on the web where you can see the comparative performance differences regarding head loss by pipe size. Here is a guide to reading the chart. Excerpt from head loss chart found at the link above. The flow capacities are provided by each manufacturer's website. They identify valve performance based on Rated Flow rates of maximum continuous duty performance determined by AWWA. 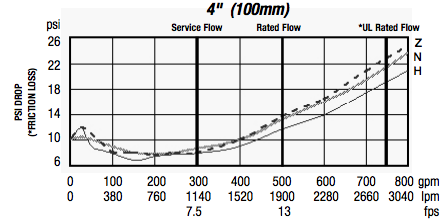 The chart below shows the flow characteristics of the Watts 957. All three variations are graphed. The data reflected in our chart to the left is for the 957N of 13 APSI. 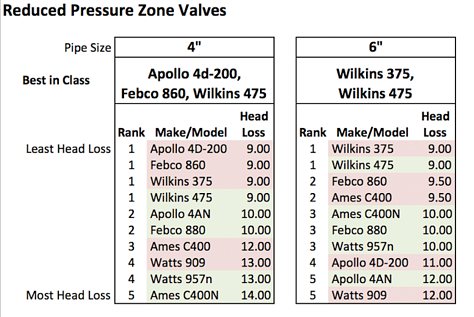 Use the chart to determine how the leading manufacturer’s valves perform with respect to head-loss efficiency. The head loss number in the right column is shown in atmospheric pounds per square inch (APSI). In some pipe sizes you will see that several assemblies perform at the same level but no one assembly is best at all pipe sizes. The pink entries are the conventional (larger enclosure) models. The green entries are the n-type (smaller enclosure) models. Get up to date on the latest trends in backflow preventer installation. Download the guide now. In 1996 the American Society of Sanitary Engineers (ASSE) developed a quality and safety standard for aboveground enclosures. It is known as ASSE Standard 1060: Performance Requirements for Outdoor Enclosures for Fluid Conveying Components. This standard provides design guidance in five specific areas of concern: freeze protection, strength, drainage, security, and accessibility. After ten years, the standards committee realized it had underspecified the necessary guidance for the heater component because the heater units found in all but a few manufacturers’ enclosures were not even rated for wet or damp conditions. In fact, the heater unit being shipped in the vast majority of these boxes was nothing more than a standard wall heater available at any discount supplier. Once it was clear how much water was flowing through them, especially when a catastrophic water flow event occurred, it was clear that the heater unit needed to be rated for these conditions. In 2006, the committee reconvened and amended their guidance for the ASSE 1060 Class-1 (freeze protection) standard. “Enclosure shall be heated to maintain an interior temperature of 40° with an outside temperature of as low as –30°. Heater source shall be listed by an independent product safety listing organization as “suitable for wet and damp environments”. According to the state of North Carolina research team, there are three heater units being shipped today with a heater that meets the ASSE 1060 Class 1 standard. WaterSafe™ refers to their heater unit as a radiant heat solution. Safe-T-Cover® uses its patented sealed floor heater. Cable-wrap or tape is a popular method for smaller solutions, but with heat generation of only 5 watts per foot, this solution has limited value for pipe sizes larger than 2 inches. 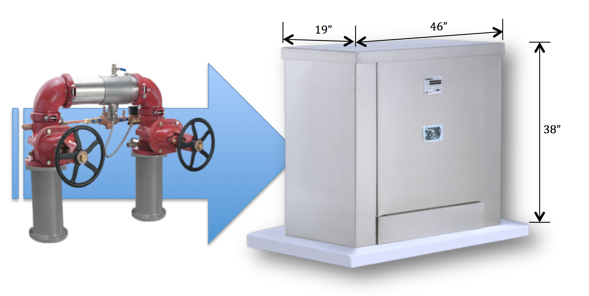 Now, a decade later, we’ve only recently learned that despite this change in guidance, there are only three manufacturers that ship a backflow enclosure that meets the requirements of this standard. We found out – by accident – from the state of North Carolina. 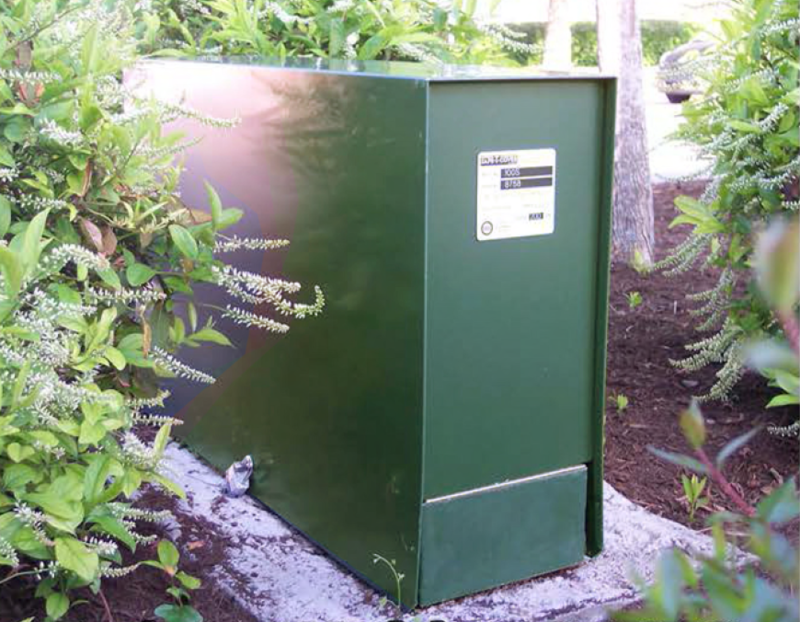 Because of changes in perceived hazard, the state had made the decision to retrofit 55 double check BPAs that were in underground vaults to aboveground RPZs in ASSE-1060 enclosures. Because they knew they had to meet the class-1 guidance, they did an in-depth review of all the available covers with a heater that satisfied the standard. They learned – and informed us – that there were only three heat sources being used today that satisfy the standard. The non-approved, but still widely used wall heater method, in addition to being noncompliant with the ASSE standard, is simply unable to deliver the freeze protection provided by a floor heater. Because of the door configuration, wall heaters must be mounted to one side. And because they do not meet the wet/damp requirement, they must be mounted at a minimum of 12” off the slab. Remember that heated air always dissipates straight up, so these heaters’ warmth channels straight out of the top of the enclosure long before uniform warmth is achieved. Alternatively, in addition to meeting the ASSE 1060 standard, the floor heater bolts directly to the concrete slab and produces conductive heat to the concrete slab. The heat penetrates as much as 16 inches down into the vertical riser pipes. Additionally, Safe-T-Cover doubles the roof insulation to R-18 further insuring a uniformly warm environment inside. In side-by-side tests conducted by John Chai for the Department of Mechanical Engineering at Tennessee Technological University in 1997, the floor heater allows for as much as 32% fewer thermostat on-off cycles on cold-weather days. Sure. You can get brushed aluminum if that’s what you want. In fact, that’s the color you will get if you do not specify. However, after hearing from hundreds of civil designers, we learned that by offering our entire line in a few common colors at the base price, we substantially increase the versatility and desirability of our backflow enclosure aesthetics. So, in 2015 we began offering our entire line of covers in four standard colors. At the base price, you can choose a backflow preventer cover in Hartford Green, Slate Grey, Sierra Tan or the standard Brushed Aluminum. Our goal is to provide an option which helps blend the aluminum enclosure into the scenery, whether it's hidden in the greenery like the one pictured or integrated into a desert landscape. Of course, we can ship in most any custom color as well for a nominal cost, but by offering these standard colors, we find that we satisfy most design needs. So, if you want something other than brushed aluminum, specify a color. With four colors to choose from at no additional cost, you would be missing an opportunity to enhance the final look of your site. It's not quite so simple as you thought, eh? There are a lot of facets to consider when designing the system. Specifying each one brings you closer to a more efficient and attractive backflow installation.A little attention to detail during the design process means a lot less hassle and stress in the long run.